Jennifer Billstrom combined two things she loves about living in Western North Carolina—road biking and local food—when she created the region’s freshest event on two wheels. Cycle to Farm metric century is a 62-mile ride through Black Mountain, Fairview, and Old Fort that takes cyclists to farms along the way for tasty samples and socializing. Riders can meet the farmers and buy cheeses, meats, and vegetables. Their purchases will be shuttled to the finish line in Black Mountain for pickup. The moderately strenuous ride starts on the Black Mountain Greenway, which will benefit from event proceeds, and includes several climbs and part of the Point Lookout Trail, the original route between Old Fort and Ridgecrest. 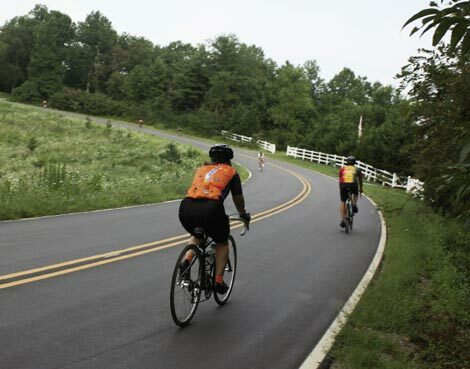 Along the way, riders will take in long-range views, quiet country roads, and bites at stops such as Looking Glass Creamery, Harvest Table Farm, and Peaceful Valley Farm, which sells its heirloom Crooked Creek corn to Troy & Sons moonshine distillery. It’s one ride that offers a new take on the farm to table movement.